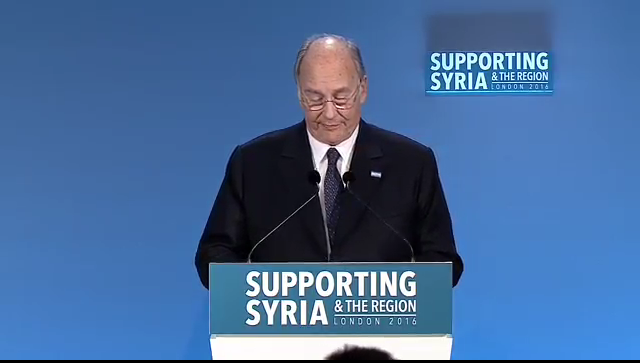 His Highness The Agakhan making statement today at the Support Syria Conference. The Imam has announced that the AKDN will support Syrians by increasing investment to $200m over next 4 years. There is one on AKDN but the last sentence is missing on AKDN, the complete version is on the link we have given on our FB page. I thank the co-hosts for organising this much needed initiative to deepen the understanding of, and garner international support for the peoples of Syria, Alongside all those present here today, I am deeply distressed over the indiscriminate and widespread devastation of life and property, including that of irreplaceable cultural assets which are the manifestation of Syria's stunningly rich pluralistic history. The Aga Khan Development Network (AKDN), which is the Ismaili Imamat's global agency for supporting development, is fully engaged with the peace process under UN leadership, and is firmly committed to helping build a Syria that continues to respect pluralism, remains secular, and embarks on a political process led by Syrians. Second, we are investing in communities, by supporting agriculture, income generation, early childhood education, schools, and hospitals. We also provide vocational training to create skills. Our goal is to sustain hope. We aim to meet the urgent needs of the present, but where also possible to protect and strengthen the foundations for the future. We seek to create "islands of stability" , where there is public consensus, in the face of war. It is my conviction that "islands of stability" can be replicated wherever security permits. Investing in them will help prevent displacement of people and anchor communities that would otherwise flee as refugees. Since the onset of conflict in 2011, AKDN has dedicated $50 million towards these endeavours in Syria and is now committing to increasing this investment to $200 million over the next four years. Our efforts will expand to wider areas of the country. Our goal is peace, stability, and reconstruction.